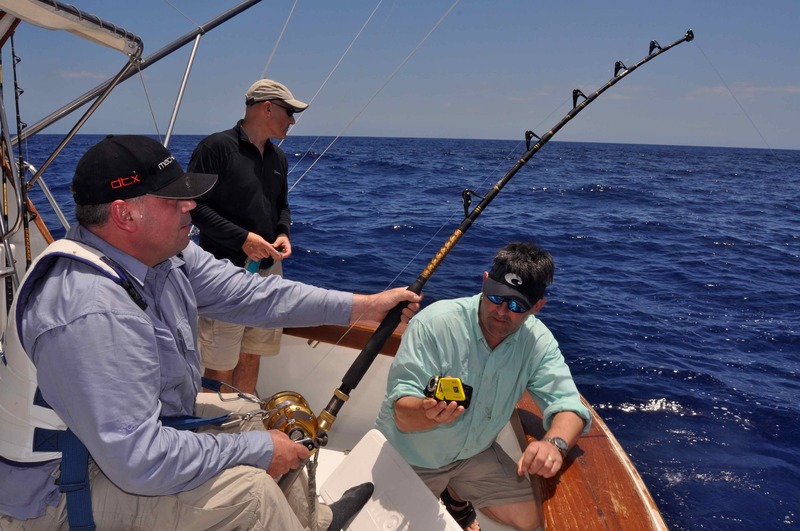 Just as the fight started to settle down and we all thought that the marlin was going to stay attached for long enough to be brought alongside for a quick photo session, tagging and a triumphant release, it came off. Why, we’ll never know, it was simply one of those things that guides the world over explain by saying that this is the reason why our sport is called fishing, not catching! We had lost the fish and now all we could do was go and try to catch another live skipjack for bait, then go look for another one. She had first announced her presence by violently slashing her thick bill at the dead skipjack bouncing through our wake off the flat line, but moments later she had lost interest in this and switched to the live one swimming off the port rigger. Again she had remained undecided and drifted back for another look at the dead bait, her pectoral fins glowing a brilliant lilac blue in the intense tropical sunshine. We had all stood by waiting for the bite that we were certain would come, but again she had refused to eat. Everyone of us was as tight as a drum skin as for several anxious minutes she tracked our baits, before sinking out of sight into the inky blue depths of the Indian Ocean. At this point we had assumed the marlin had lost interest and swam off in search of a more appetising snack, in these rich seas there is plenty of choice, but moments later a resounding crack snapped open the release clip on the rigger and the large bow of slack line hanging below it drew taught. We allowed a few extra yards of line to spill off the reel to give her time to turn and swallow the plump 6lb tuna, before smartly pushing the lever drag forward to strike. ‘Moana 2’ surged forward to set the hooks, at which point and upon feeling the pressure of the line the great fish had exploded into the air in the first of a dramatic series of head shaking jumps, a black marlin of around 400lb that seemed to defy gravity as she hung silhouetted against the cloudless sky. She made her first run, perhaps a hundred yards, before again taking to the air in an equally impressive display of unleashed, acrobatic aggression, and then she ran again, stopped, raised her broad head and shoulders above the surface, violently shook her bill, and tossed the hook free. Nobody said a word. The mate shrugged his shoulders, I put my cameras away, and we carried on fishing. Mauritius ranks as one of the worlds great big game fishing destinations, boasting a long and impressive history that has produced considerable numbers of huge marlin, yet despite having fished extensively throughout the Indian Ocean during the past 20 years this was my first trip to the island. I had been invited to spend a week sampling the variety of sport fishing options on offer courtesy of Black River based JP Henry Charters, who have been operating here since the mid-1970’s; certainly it will not be my last trip! You only have to study the topography of the local seabed to learn just why Mauritius is such a productive big game destination. The first drop off lies incredibly close to shore with depths swiftly plummeting to 3000ft less than a mile out from the south west coast. 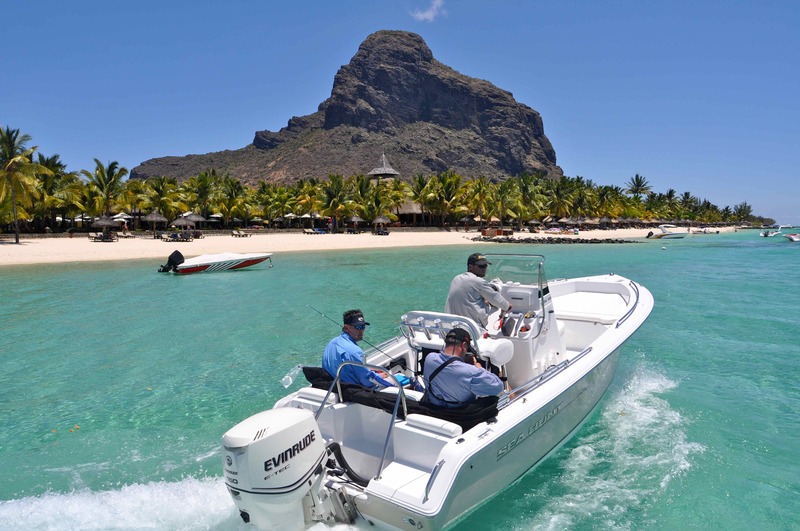 Soundings of 4,500ft, the famous Le Morne drop off, are found just 3 miles from the islands iconic Le Morne mountain, which is located on the south western tip of the island, just a few miles south of Black River, the home port for most of the island fleet of game boats. Here strong oceanic currents push nutrient rich cold water upwards, the start of a productive food chain that sustains masses of small baitfish and squid. These attract immense shoals of skipjack and other species, which in turn attract the oceans major predators, notably those with bills! On my first day I fished aboard ‘Moana II’, an immaculate locally built 42 footer powered by twin Caterpillar turbo diesels. Looking around my impressive ride I assumed she was relatively new, perhaps as much as 5 years old I had figured: how wrong I was! Moana II first started pulling lures off the coast of Mauritius over 20 years ago and it is a credit to her crew that she has been maintained in such pristine condition. Truly she is immaculate without even the slightest whiff of stale fish or diesel anywhere, hell even the heads are showroom clean! This, I was to find, is a trademark of all boats within the JP Henry fleet. That days we had trolled lures on 50, 80 and 130lb class outfits until we found the shoals of skipjack, caught a few, then switched to slow trolling live baits. This I was to learn is the most popular and often the most productive technique in Mauritius, though some day’s boats will fish lures exclusively. That first day the skipjacks failed to work their magic, and after a couple of fruitless hours we switched back to a standard spread of lures in an attempt at covering more ground to locate the marlin we knew were present, and quickly hooked up with a decent wahoo. After about an hour of trolling the blue and white bucktail lure fishing off the short right was smashed in a swirl of white water, the rod bent and line screamed off the reel. That first run stripped several hundred yards of line at a speed that at first had suggested marlin, however when after a ten minutes without any sign of the fish the usual onboard identity guessing game began. Possibly it was a foul hooked billfish, thats why it hadn’t jumped? 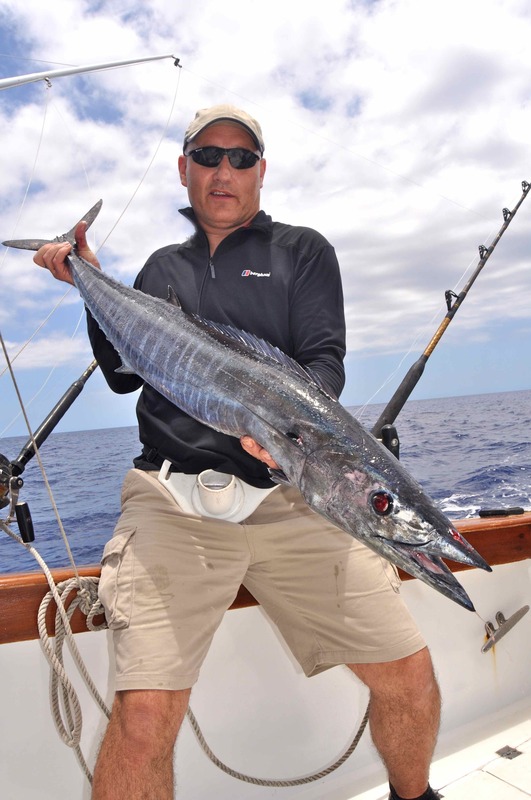 A big wahoo, no too powerful? Maybe a tuna, someone had countered, but if its a tuna why hasn’t it dived deep? Scott Mackenzie, the world champion Spey caster, was in the chair, experiencing for the first time the raw power of a big tropical game fish; a very different gig from fly fishing for the Atlantic salmon he is famous for catching in his native Scotland! Fifteen minutes into the fight and still we were none the wiser as to the fishes identity, though by now the smart money was leaning towards tuna. Scott was gradually getting used to the unfamiliar tackle, while everyone else strained for that first tell tail glimpse that would confirm what exactly we had hooked. Finally it came into view and we could see it was a tuna, a solid, butter fat, brilliantly coloured yellowfin that later when weighed back at the dock at Black River registered 140lb. The drinks were on Scott and over a cold beer at the club bar we learned two boats had released marlin earlier that day. On my second day again we were fishing aboard Moana II, and apart from boating several more tuna we hooked and lost the black I’ve already told you about, then a couple of days later I was fishing offshore again, a morning half day on one of the smaller JP Henry boats. Conditions were perfect with flocks of birds covering busting shoals of bait seemingly everywhere we looked. Our game plan was to catch a few on small jigs, bridle rig them, then toss them back into that gorgeous blue water. That was the plan but this day the skipjack were extremely hard to hook, and each time we caught one or two they were either quickly cut by wahoo or died soon after rigging. Eventually we switched back to trolling and almost immediately lost a small blue that smashed the right short. We don’t know exactly what went wrong but the line parted on the strike, and out best guess was that somehow it had become wrapped around the tip. As I said we were fishing a short day and all too soon we were back at the dock and guess what, the boat went straight back out with another charter who had booked the afternoon, and caught a 585lb blue! My time in Mauritius was spent exploring all fishing options on offer, notably the popping and jigging, which the island has massive potential to develop, yet while I was there Marlin were caught every day, and this was early season. 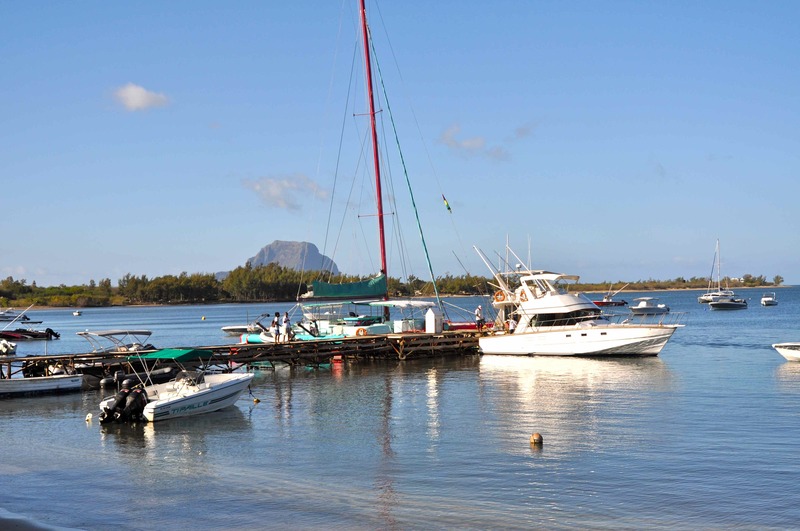 The more time I spent hanging around the dock and the bar at Le Morne Fishing Club, the focal point of game fishing on Mauritius, getting to know and talking to the skippers and crews, the more I began to realise just how productive a fishery Mauritius is today. A few years back the island experienced a few quiet seasons and many thought it’s days as a world class billfish destination were numbered, but the sceptics have been proved wrong, indeed where in the world has this not been the case? Like so many other fisheries I visit throughout the Indian Ocean, in recent years the quality of fishing off Mauritius has been going from strength to strength, and like almost everyone I speak to on this subject I am absolutely convinced this can be attributed directly to Somali pirate activity limiting the affect of the worlds destructive oceanic commercial fishing fleets. 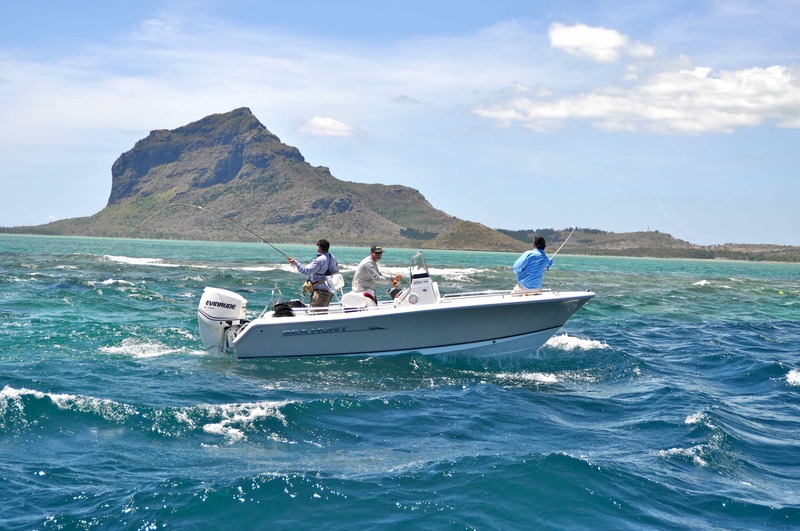 Scott & Hywel setting off for a session fly fishing under the impressive Le Morne mountain, Mauritius, well someones got to do it! Certainly the paradise island that is Mauritius is a one of the worlds great destinations for anyone looking to catch a grander blue. The island record blue marlin stands at 1,355lb, that’s just 21lb below the current all tackle world record, and this fish was taken by an angler fishing with JP Henry Charters. 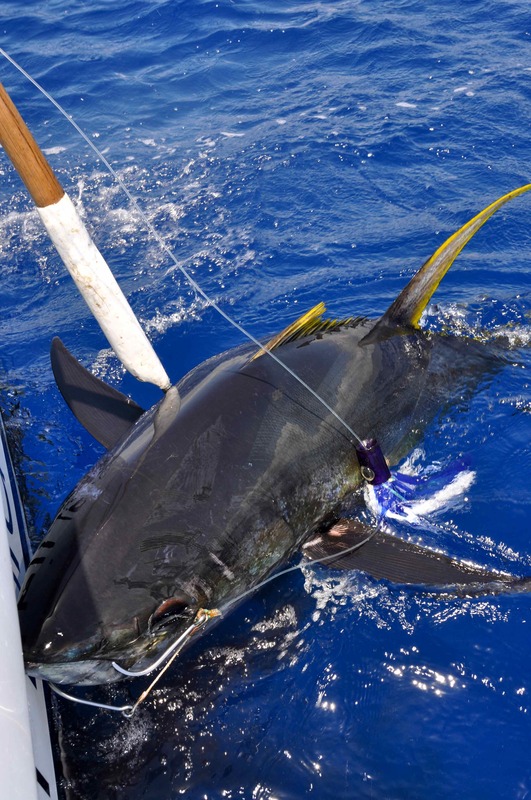 Records show that each year an amazing 3 ‘grander class’ blue marlin are caught in the seas off Mauritius, plus another 4 or 5 by locals fishing hand lines! There are always a few marlin around, but the main fishing season in Mauritius starts in October and continues through until April. Early season it’s mostly blacks with an occasional blue that earn bragging rights for visiting crews, plus this is also the time of the year when most of the very big sharks the island is also noted for are caught. Prime blue marlin season starts in December peaking around February and March, though blacks and an occasional striped marlin or sailfish are also caught. I was told that there are a lot more sailfish here than records might indicate, but they are simply not targeted and most of the techniques used for marlin are not conducive for sails. 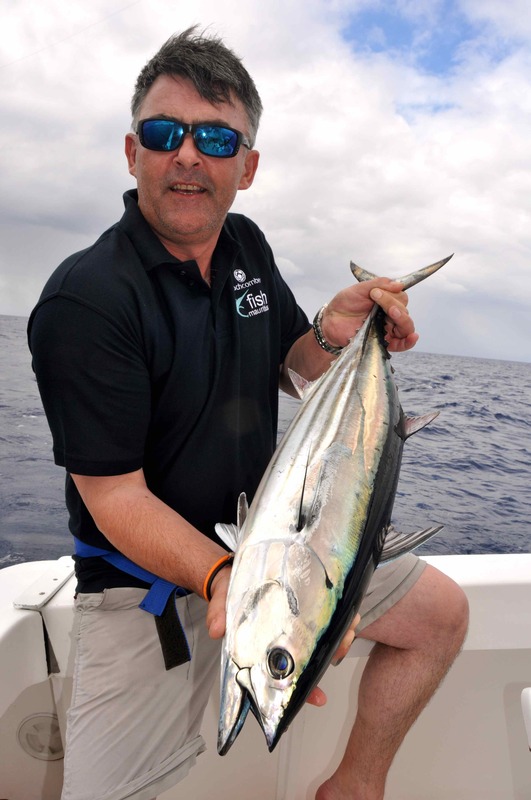 Shortbill spearfish are also caught here with some degree of regularity, December through April seems to be the most productive time for these, making Mauritius a great place for anglers, like me, who are looking to complete their Royal Slam! 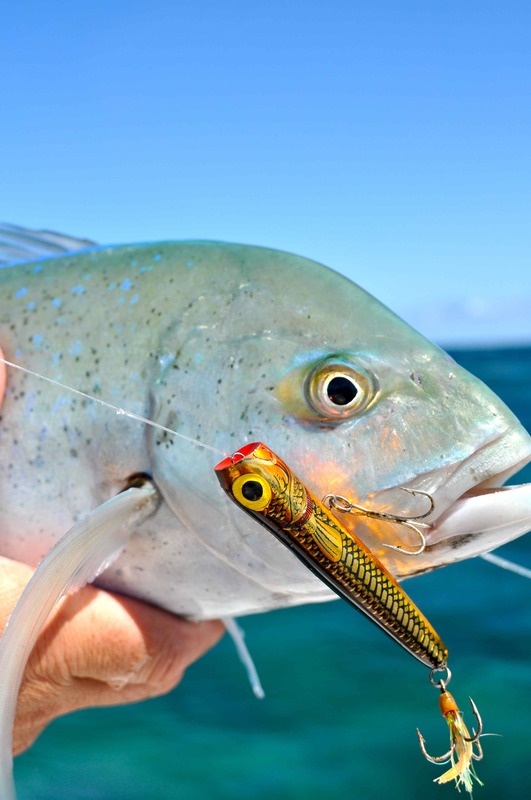 Heavy tackle is used as the rule in Mauritius as each time you put a lure in the water there is always a chance of hooking a very big fish. Every year many seriously big marlin are lost after hook up when they dive deep into the blue abyss and subsequently break the line. Other notable captures aboard the JP Henry fleet include the current Ladies 130lb class world record blue at 950lb, the world record mako shark at 1115lb, the world record 80lb and 130lb class dogtooth tuna records at 224lb and 230lb respectively plus a clutch of line class records for skipjack tuna. 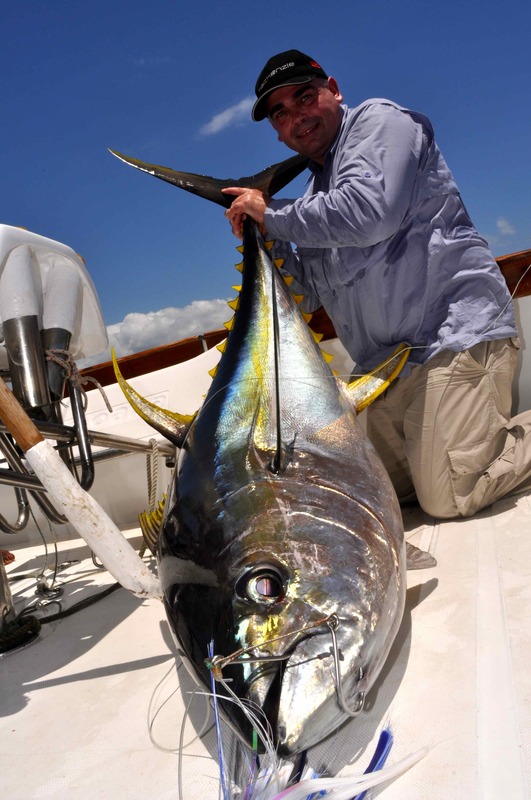 Aside from the exceptionally high quality of it’s fishing, Mauritius is the perfect destination for a tropical holiday. Tourism is one of the islands major sources of income; others include sugar production and textiles. 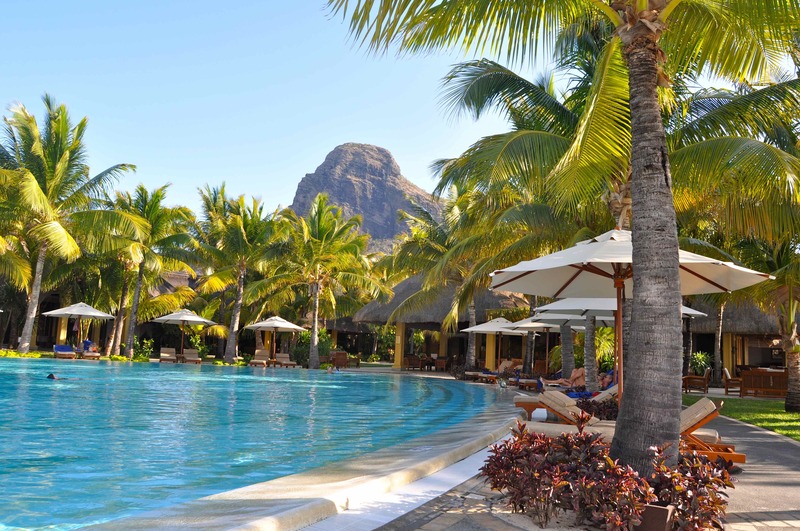 Mauritius is widely regarded as being a very safe tourist destination, with a well maintained road infrastructure, good health care and political stability. It is non-malarial, and located well outside of the section of Indian Ocean currently affected by Somali pirates. Looks like you had a cracking Trip. Ive just returened from mauritius. Managed a 10 hour trip out on Popeye from the Maritim hotel. Caught nothing, day before they had many fish and several species, same for the day after; guess it just want meant to be for us. Still i learned a lot about a different type of fishing. Maybe infuture will try to get back out there. Thats big game fishing, some days you catch, others you don’t! Good luck for your next trip. All the very best. Mauritius really is one of the worlds great big game fishing destinations, and the absolutely perfect location for non-fishing partners. You should go there!